Welcome to Adkins Bee Removal. Providing options for live bee removal and relocation to public and private organizations as well as to the general public. We work with beekeepers throughout the US removing and relocating bees. Call the bee removal hotline, to connect with your beeguy, it’s quick and easy! Live bee removal from walls, roofs, attics, chimneys, trees and other odd places bees nest, with solutions for recurring bee problems. Bee removal can be dangerous and sometimes difficult; a few bees buzzing around the exterior or inside the house is usually sign of a beehive. An established beehive consists of many thousands of bees with lots of honeycomb. 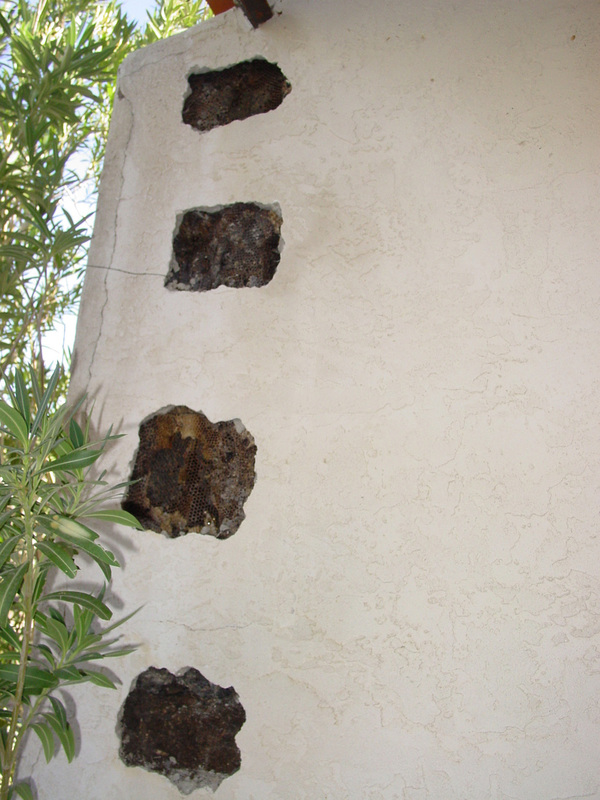 Sometimes a bee exterminator is used to exterminate the bees, but the honeycomb is left in the wall. Removal of the honeycomb is the key to solving a bee problem and not creating more problems attracting rodents and bugs, melted honey damages, and recurring bee problems. If the bee colony has just appeared and is congregating outdoors, it is called a swarm. An average swarm may be 5,000 bees and the size of a football or larger. In the case of a swarm on a shrub or tree, it can be best to leave alone a day or two; bees will typically rest on a tree, bush, or an external structure a few days before moving on. If the bees have not left within a few days, bee removal is a good choice. If the bees are in your wall, attic, chimney, or an enclosed area, the sooner the problem is addressed the less honeycomb will typically need to removed. For Self-help info covering bee removal topics based on the location of the bees nest visit How to get rid of bees. An important part of solving a bee problem is to know what type of bees they are, see the Bee id chart to help with identification. You can request a quick callback, or get a free quote online. Review a brief history of honey bee removal in the US. Free estimates and same day service for most of the US, bee removal by county. For remote areas, call (800) 900-9095 to check availability. Bees often stay inside during windy or rainy weather.